Fancy leaf caladiums are a great addition to the often all-too-green shade garden. 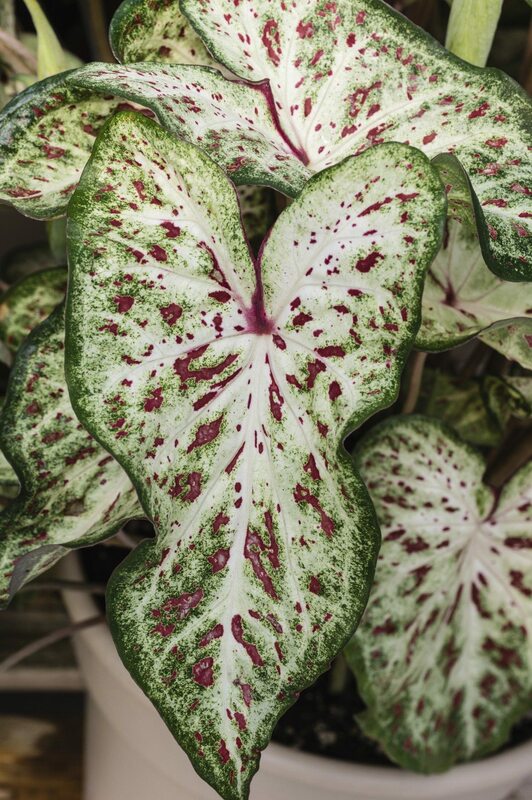 With well over a dozen cultivars, ranging from white through pink to deep, dark red with contrasting edges and veins, fancy leaf caladium bulbs offer enough variety to satisfy the fussiest gardener. These caladiums, as with others, can be used as single specimen accents or planted in groups for a dramatic-looking tropical display. The 12-30 inch heart shaped leaves will retain their color throughout the summer and into the early fall if treated properly. But before you decide to grow fancy leaf caladiums, there are a few things you should know about them and their care. Fancy leaf caladiums or Caladium x hortulanum originated in Peru and around the Amazon Basin in Brazil. Outside of the tropic zones they are usually grown as warm weather annuals. In northern climes, they’re used both as bedding and potted plants for display in the garden or on the porch. In the spring, you can buy these gorgeous plants full grown from the nursery or florist, but it’s much more economical and, in this gardener’s opinion, much more fun to grow fancy leaf caladium bulbs on your own. With such lush tropical results, you might think these beauties were difficult to grow. In fact, it’s easy to grow fancy leaf caladiums once you know how. The larger the tuber, the larger the number and size of the leaves. Regardless of size, each tuber has a larger central bud surrounded by two or more secondary buds. Now here’s the thing that makes new growers wince. Take a sharp knife and cut out the large central bud from your fancy leaf caladium bulbs before you plant them. 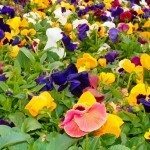 This will encourage the growth of the secondary buds and give you a fuller but just as colorful plant. Fancy leaf caladiums require loose, slightly acidic soil for good root growth and are heavy feeders. Before planting, dig in plenty of peat or pine bark to take care of the first two requirements and add a good dose (1 tbs/plant) of 10-10-10 fertilizer. Follow that with a 5-10-10 or similarly heavy potash and potassium fertilizer every 4 weeks until fall. Plant your tubers 2 to 8 inches apart depending on size. A fancy leaf caladium’s tubers need warm (about 70 F. /21 C.) soil to grow. If the soil is too cool, the bulbs tend to rot. Therefore, many growers choose to start their tubers indoors in shallow pots or flats filled with peat moss or light potting soil. Place the tuber bumpy side up and cover with about two inches of soil. Be patient, as it will take three to six weeks for leaves to emerge. The bulbs can be moved outdoors anytime thereafter as long as the outdoor soil is warm. Water well and make sure the ground never becomes too hard and dry during the season. Water thoroughly when the soil is dry to the touch. Fancy leaf caladiums are perfect for those heavily shaded areas of your yard and their bright colors and broad leaves offer a perfect complement to ferns and hostas. If you must plant them in an area of direct sun, make sure it’s the gentle morning kind. Keep them well watered and fertilized and they will reward you with a colorful tropical treat.